The Rotman School is part of the University of Toronto, a global centre of research and academic excellence at the heart of Canada’s multicultural commercial capital. Rotman is a catalyst for transformative learning, insights and public engagement, bringing together diverse views and initiatives around a defining purpose: to create value for business and society. Visitors to Rotman often comment on the special feeling in the air. We know what they mean. The energy and pace of a top-tier business school create a definite buzz: Students launching and advancing their careers. Researchers sharing breakthrough insights. Respected thinkers and business leaders exchanging views with the wider community. But there's also something more. A sense of momentum. Growing impact. And above all, transformation. At Rotman, extraordinary people come together to rethink assumptions. Reinvent models. And redefine expectations. This is a place where change happens. Students at every career stage come here to gain the knowledge, agility and confidence demanded by a world that keeps accelerating. Learning at Rotman goes deeper - into a rigorous, model-based problem-solving approach that shapes effective decision makers. And it also goes deeper into personal development, with programs designed to help you fulfill your potential as a leader, entrepreneur or agent of change. 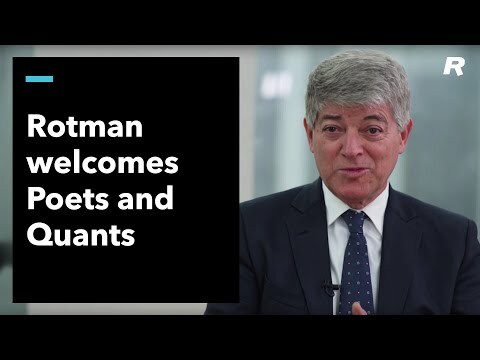 Coming to our school with diverse backgrounds, education and experience, Rotman graduates go on to well-established companies, innovative startups, not-for-profits and the public sector. And they make their marks. From gender inequality in the workplace to the cost of tax havens, Rotman researchers push the boundaries of inquiry. And their insights travel from our campus to boardrooms around the globe. To cite just one example: the design thinking that now drives so many efforts to reshape organizations and business models had Rotman as its proving ground. Our faculty comprises scholars and teachers who've earned acclaim for their interdisciplinary insights grounded in management expertise. And it includes many seasoned professionals who tap into their real-world experience to guide students and bring classroom discussions to life. How does machine learning support business strategy? What are the risks and rewards of market disruption? Can behavioural science help to strengthen customer loyalty? These are the kinds of questions we ask to stimulate broader conversations - through events, conferences and a wide range of publications, including our award-winning Rotman Management magazine. Supported by our highly regarded research institutes, centres and labs, we engage regularly with a large and influential community of stakeholders. Rotman is part of the University of Toronto, a global centre of research and teaching excellence. Since 2002, we've quadrupled Rotman's endowment, dramatically increased our faculty and tripled our footprint on U of T's tree-filled urban campus. We're located just blocks from Canada's commercial and financial hub, where we nurture vital collaborations and career-building opportunities. And from the heart of one of the world's most dynamic and culturally diverse cities, we're connected to the world through a network of business and research partners and globally engaged alumni. At Rotman, the constant interplay of ideas and points of view sparks new ways of approaching problems and illuminates unexpected connections. We bring together the right minds, resources and support systems to ignite breakthrough solutions. And we encourage talented people to identify - and create - those critical moments of convergence and inflection where change begins. While we provide the management fundamentals that tomorrow's leaders need, we're also here to explore alternatives, test conventions - shake things up a little. The people who come here to learn, teach and discover share a desire for change - whether that means changing direction, changing traditional thinking or changing the world. They feel Rotman's catalytic energy as they walk through our doors. And so will you.